You may not think too much about those roller skates and how they came to be when you put them on your feet at Roller Kingdom. While you may enjoy rolling, turning, and gliding across the skate floor, skating was not always as simple as it now is in our Tyngsboro and Hudson rinks. Taking a look at the history of skating, it is evident that the first pair of skates recorded as an invention took their place in the history books in 1760. These skates, developed by inventor John Joseph Merlin, were made with small metal wheels and had their wheels in one line similar to modern day inline skates. It was not until nearly sixty years later in 1819 when the first patent for roller skates was recorded. These skates again were similar to modern day inline skates, but were still quite basic. Simple maneuverability was quite difficult. A large improvement was made in control and maneuverability in skate design in 1863. A furniture store owner named James Leonard Plimpton designed quad skates with two pairs of wheels. This allowed skaters to turn more easily and led to the first public skating rinks in the United States in 1866. 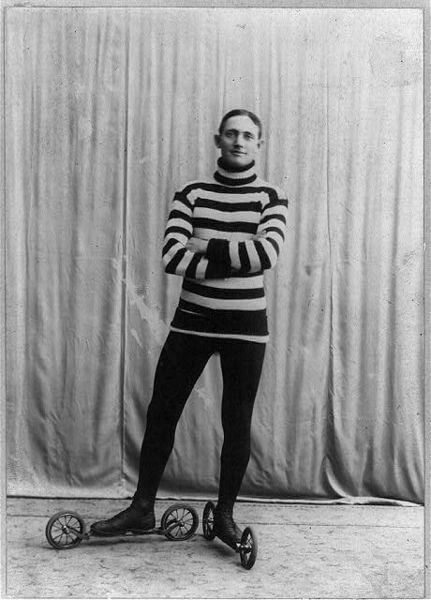 As skating design continued to change and safety measures such as the toe stop, added in 1876, skating started to take off. Roller skating was largely popular in the United States between 1935 and the early 1960’s. Another spike in skating interest took place in the 1970’s with further wheel improvements and disco music. Fast forward to current day and roller skating is still alive and well. In addition to skating for fitness and fun, at Roller Kingdom speed skating and artistic skating are still a part of what happens each week. Looking back at the history of skating and the change in skates over the years, it leaves the question that is ultimately a personal choice now. What is better, quads or inlines? Feel free to weigh in on your opinion regarding quads or inlines on our social media channels. Make sure you follow us on Facebook, Twitter, and Google + to keep up with modern day skating events at Roller Kingdom.